If you're craving some on-the-go Batman action, this might not be your best choice. The Batman games have been increasing in quality ever since the release of Batman: Arkham Asylum. The series has been in good hands, and we've consistently seen fantastic games cranked out since. This time around, in a bid to prepare gamers for the release of Batman: Arkham Origins on consoles, Netherrealm Studios has prepared another iOS adventure to be released as a mobile tie-in. Arkham City Lockdown was a fantastic tie-in game to accompany Batman: Arkham City, but Arkham Origins stumbles here and there, especially considering its dubious free-to-play model and lack of subtitle to help would-be players discern which game is which. 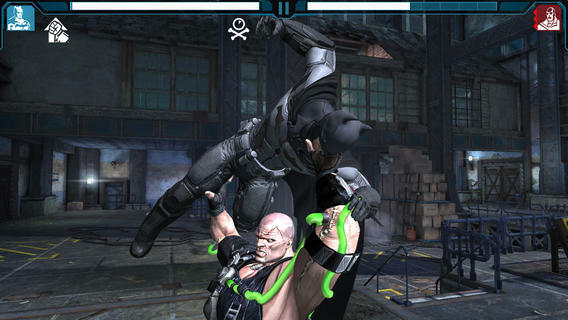 The recent Injustice mobile game was an excellent starting point, and that's the same control scheme used in this game as well, but it's simply not as satisfying as Lockdown's setup. You're doing quite a bit of damage, but it doesn't feel as though you are on-screen. It's decidedly less visceral and punchy, and the long pauses during move input give it a slowed-down feel that isn't exactly trademark Batman. However, I can understand the changes made to the flow of gameplay and the differences from game to game. What doesn't make sense is the free-to-play model that feels built to rob you of every extra penny it can. You can play the game for free (technically) but there's the option to use currency to bring yourself back to life, to raise your stamina, or to continue playing once you've exhausted your play time for the day. If you decide instead to wait for timers to reset or to do something else while counting down until the next time you can don the Batsuit, you won't have a problem with this set up. For less patient players such a myself, this is a huge hindrance that sends me out of the arms of Arkham Origins and into the loving embrace of a game I can pay outright for without having to wait to experience when I want it, or pay more out of pocket for. The lack of in-game immersion, mundane unlockables, and frustrating bit of free-to-play wheeling and dealing make the iOS tie-in of what is undoubtedly the better "big brother" console game feel obsolete. If you're looking for a satisfying experience as the Dark Knight, shell out the cash for a more memorable adventure that doesn't rely on tired convention and extra moola.